Need secure, cost-effective certificates? 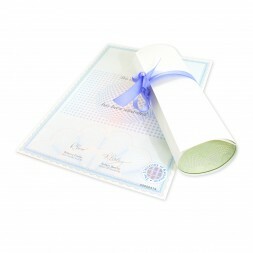 We provide bespoke certificate printing solutions to a wide range of Uk and international organisations. Contact us to discuss your requirements and get a free no obligation quotation. Kalamazoo is a leading secure solutions provider with vast experience producing certificates designed to protect against fraud and replication. We produce secure printed certificates for a range of organisations with a diverse range of requirements. If you do not have artwork pre-prepared, our in-house design team will utilise their many years experience in security print design to combine all your requirements with the latest security features. We can produce completely bespoke certificates or provide a number of personalised, cost-effective options using our secure base certificate stock. Our credentials and experience as a leading secure solutions provider enable us to securely produce and fulfil a range of certificate requirements. Speak to our advisors about how we can help you.